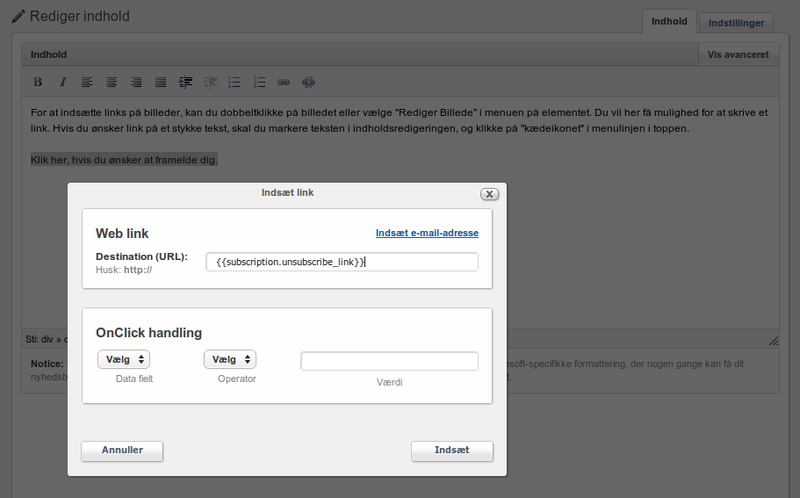 Ubivox automatically inserts an unsubscription link at the bottom of all of our standard templates. If you wish to control the placement of the unsubscription link on your own, you have to insert it by yourself. Click Insert and save the content. You now have a link to the unsubscription page that, by a click, will unsubscribe the receiver from the Ubivox database. If you have inserted your own unsubscribtion link you are able to remove the link that Ubivox automatically inserts. Click Template options when you are editing the newsletter and then click Change template settings. At the Global tab you will find the unsubscribtion text – delete it and save. The link will now be removed from your newsletter. Please be advised that the law as well as our anti spam policy, requires that there always is an unsubscription link in newsletters.